Swedish Minister for the Environment Karolina Skog helped launch the Swedish Traffic Safety Council for Active and Sustainable Mobility “Moving Beyond Zero”; a major rethink of Swedish road safety priorities on November 16, 2017 in Stockholm, Sweden. 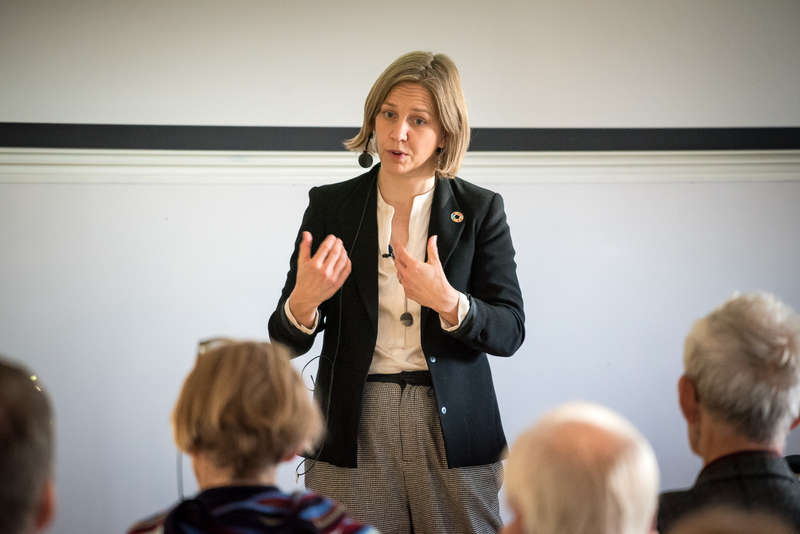 The Swedish Traffic Safety Council for Active and Sustainable Mobility unveiled the new active transport advocacy campaign “Moving Beyond Zero”, at a seminar opened by Swedish Minister for the Environment Karolina Skog. As chairman of the Swedish cycling advocacy organization Cykelfrämjandet and a founding member of the Traffic Road Safety Council we think this is a crucial development in maintaining and improving Sweden’s road safety heritage, particularly for cyclists and pedestrians. At the launch the minister praised Sweden as an example for other countries for traffic environments, but that it is time to move Vision Zero into the future. She also presented the Swedish government's new strategies for urban planning that can contribute to increased cycling, health and improved civic environments. The public health and quality of life benefits of active mobility need to be given a more prominent role in the traffic safety discourse and in the socioeconomic models used for assessing infrastructure initiatives. The Traffic Safety Council campaign aims to encourage traffic planners and transport decision makers around the world to improve upon the 20-year-old campaign “Vision Zero” by factoring in the health benefits of active transport. For twenty years Vision Zero has sought to reduce traffic fatalities and injuries to zero. Launched in 1997, the initiative has played a major role in halving the annual traffic fatalities in Sweden. The campaign has inspired traffic planners around the world, but sustainability mobility campaigners think it misses the potential health benefits of promoting active forms of transport. The campaign was presented at GIH, the Swedish School of Sport and Health Sciences in Stockholm on November 16. In addition to Minister Skog, leading researchers highlighted the positive effects of increased cycling and the benefits active mobility provides for both the individual and society. Carl Johan Sundberg, doctor and professor in molecular and applied physiology at Karolinska Institute talked about everyday activity and the many beneficial effects on the human mind and body. Anna Niska, head researcher at the Swedish National Road and Transport Research Institute, VTI, presented her work as a project manager for “Vulnerable Road Users”, a VTI project entrusted by the government with increasing the number of child and young cyclists. Peter Schantz, a professor of human biology at the Swedish School of Sport and Health Sciences and presented a study showing that if one third of today’s motorists began cycling to work the lower emissions and health benefits would save 80 lives annually in Stockholm. According to the Council the main tenet of Moving Beyond Zero is that the active element of cycling should be included within the road safety/public health discourse. The socioeconomic models that dictate our infrastructure investments must begin to take into account illness prevention and increased life quality provided by active mobility. The Transport Agency must be tasked with increasing active mobility. It is unacceptable that the Swedish Vision Zero national plan for cycling begins and ends with helmet promotion and lacks national cycling goals. Cycling is currently not mentioned in the Transport Authority’s mission statement nor is it recognized as a unique mode of transport in the national transport plan. Sweden needs a Vision Zero that saves, improves, and lengthens lives. Modern environmentally sound and healthy transport planning has to create a vision for a more active and healthier population. The Council calls on the Swedish Minister for Infrastructure Tomas Eneroth to develop a new goal for traffic and health that looks beyond Vision Zero. A new goal should lead to traffic that saves lives and improves quality of life in addition to reducing traffic fatalities and injuries by promoting active mobility in the form of cycling and walking.